Hands on session- led in a simon says manner, 1-2 haircuts focusing on strong shapes and techniques in a salon contemporary fashion. Emphasis on flat wrap blow drying, hot tool work, refining the shape and finishing. Born and raised in California’s cultural hub, Adam Federico has created a niche for himself among craft hairdressings most practiced artisans. His skillset is broad, yet honed, and he counts Master Educator, Creative Director and Stylist as his defining roles. It’s Adam’s background, rich with diversity, that has brought him to adopt the lifelong motto ‘Evolve or Dissolve.’ He lives by it: Never standing still, never becoming complacent and always reaching to achieve new goals. As an educator, he hopes to help his students to reach higher and farther than they ever thought possible. As Adam’s student, you can expect to gain core, foundational skills that deliver unlimited behind-the-chair freedom. He educates with patience, kindness and compassion, gleaned from his experience as a yoga practitioner + teacher. But above all, he will guide you in falling in love with your craft – over and over again. Session 1: Focus on Classic haircutting techniques working with pure shapes and focus on technique. All work will be done with scissor in classic pure form with any detailing through classic scissor discipline. Model will be finished and refined. Dialogue through session will surround terminology of anatomy, foundational theory, Suitability and Effective consultations working with points above. 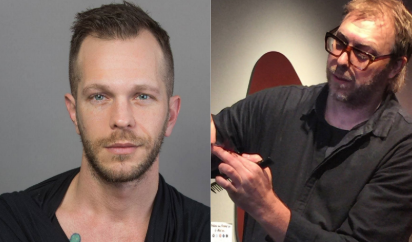 Session 2: Focus on Salon contemporary haircutting, mixing shapes and techniques, Possibly utilizing disconnection and undercutting. Utilization of razor work mixed with scissor work dependent on Model(s). Dialogue through session will be keeping your salon work fresh and yourself inspired understanding strong technique and allowing yourself the confidence to push the boundaries within your work and your clients. The abc1 Cut course is devoted to the touchstone techniques used by Sassoon trained stylists and allows you the time and space to truly perfect lines, graduation, layering and their combinations. This course provides the very best foundation for boosting your skills and knowledge, where you will be immersed in hands-on practical work sessions and detailed tutorials from highly qualified instructors. Participant must bring their own live model. This event will have three different class options. LYDIA SARFATI 2 different classes each 2 hours long. Nothing works better than facial massage to lift and rejuvenate the skin. Become equipped to perform a real workout for the face with Master Esthetician and Repêchage CEO Lydia Sarfati. Here, she will present her world renowned facial massage techniques which incorporate European, Eastern and Modern techniques to provide the best in anti-aging, brightening and calming massage. Like a personal trainer, you learn about massage with personalized, targeted results. Your clients will enjoy the skin benefits of customized facial massage for every skin type in less than 30 minutes and leave looking and feeling restored! You will learn how environmental exposure, genetics, hormonal and lack of sleep resulting in hyperpigmentation and wrinkles. 10 best ingredients for dark spots, fine lines and wrinkles. Provide sensory experience for your client to improve the wellbeing that will result in younger looking complexion. Learn most important steps to include in your professional facial treatment. Scientific solutions for correct exfoliation, massage and electric modalities, such as galvanic current – provide an “injection without the needle” approach to produce plumper and smoother skin. 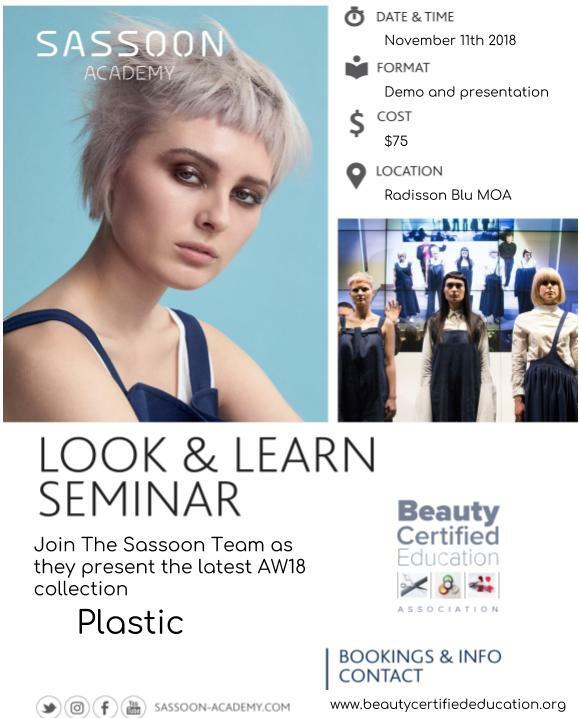 an insight into the unique world of Sassoon education. While the emphasis is firmly on technical instruction, walk-on presentation models complement the step by step cutting, coloring and styling executed by the on-stage Creative Team. “The Best Facial Massage: Relax, Rejuvenate, Renew!”Nothing works better than facial massage to lift and rejuvenate the skin. You will learn how environmental exposure, genetics, hormonal and lack of sleep resulting in hyperpigmentation and wrinkles. 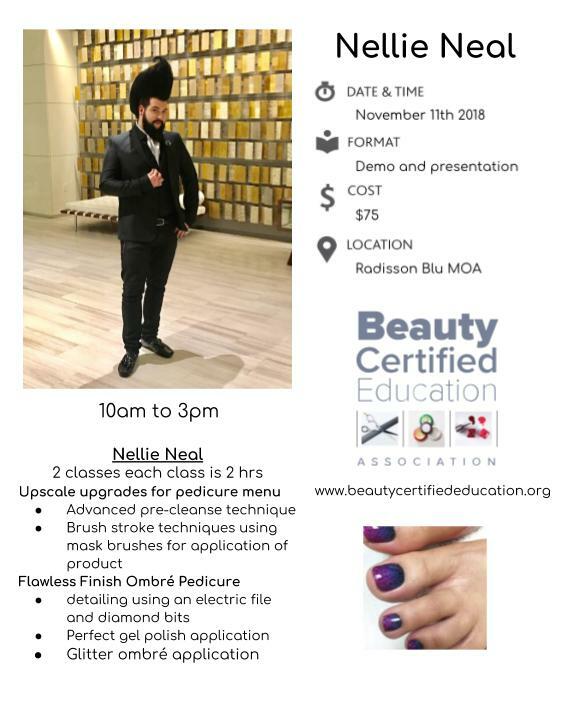 Beauty Certified Education Association presents: MN Educator Spotlight. This is 2 two hour classes for a total of 4 Professional Practice Continued Education approved by the Board of Cosmetology of MN. Steven Lai and Keith Rutten of SKD Education. Steven and Keith will explore the complexity of the graduated haircut. We will take graduation down to the basics and "elevate" the shape with multiple techniques. We will explore various types and placement of graduation and adaptable finishing skills to create our finished forms. 2hr look and learn Why limit Balayage to long haired clients? Why can’t bobs join in the fun? Any length of hair is paintable! Learn how to give the natural look of hand painted highlights to your classic bob shapes. We will discuss how to free-hand paint graduated, layered, and blunt bobs. We will also learn two quick, trendy, and beautiful bob cuts to add to your repertoire. The Bobs and Balayage class will help you bring this time tested silhouette into the modern hair color age. A great educational event, Scruples and Arrojo. Discover how these two great educational companies can help elevate your career through education. See a few of the tips and trick that you can encounter. Nick Arrojo and ARROJO master stylists this will be a demo-only, two-hour seminar. 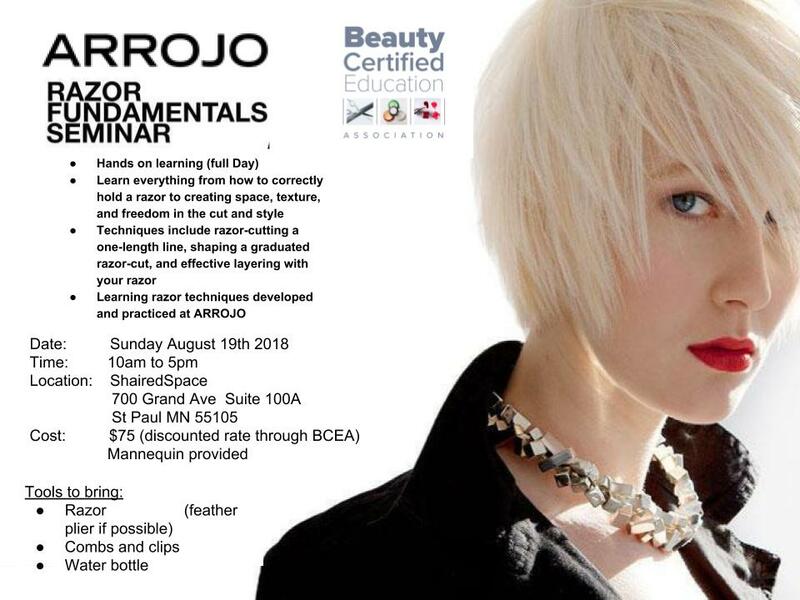 It is an opportunity for hairdressers to come and learn about the ARROJO hairdressing method. This session features live model demonstrations of contemporary techniques in scissor and razor cutting. The idea is to show the value of proper craftsmanship; shape modern creative hairstyles; immerse professionals in an award-winning culture of excellence and integrity, and display techniques stylists can use to improve their work with clients on the salon floor.